Several months ago we decided to make a new horizontal stabilizer and elevators. Our first stabilizer was one of the first structures that Chuck designed and we built. Since that time, Chuck has improved the design of the stabilizer and elevators to make them easier to build, easier to attach to the plane and lighter. I told Chuck that I would be willing to remake the stabilizer and elevators if he could save 15 pounds of weight. He says his new design will do just that. I will hold him to it. This past week we used the hot wire to shape new elevators. Next week will will start glassing them and also will cut out the stabilizer. Also this week, we continued to work on the main landing gear center mounts and Chuck made the forward console panels which will mount between the bottom instrument panel and the firewall. We also ordered our prop from Catto Propellers this week!! We requested that it be white and blue, so we are now commited to the plane being white with yellow and blue trim. Attaching a template to the end of the polystyrene foam. Elevator core ready to be covered with fiberglass skin. Styrofoam on top will be removed, see next image. This is the elevator after the excess Styrofoam and peelply have been removed. Chuck was over on Wednesday. Before he arrived, I put both elevators under black plastic and set them out under the sun to cure for 2 hours. The temperature reached 113.4 degrees F. This really helps cure and stiffen the fiberglass. We used a combination of 5-minute epoxy and Bondo to glue the two elevators to the side of our worktable. This allowed us to have access to 3 sides of the parts. We cut out all the glass cloth we would need for surfacing the top surfaces and followed the same “prepreg sandwich technique” that we used last week on the lower surfaces. We began mixing resin 5:30 PM and finished the lay-up two hours later. Thursday morning we attached the leading edges to the two elevators. These had been cut out from the original foam cores back on May 10th. We used a thick micro slurry to bond the leading edge onto the flat forward surface of the elevators. This area is technically a spar web, the “backbone” of the elevator, and very strong. 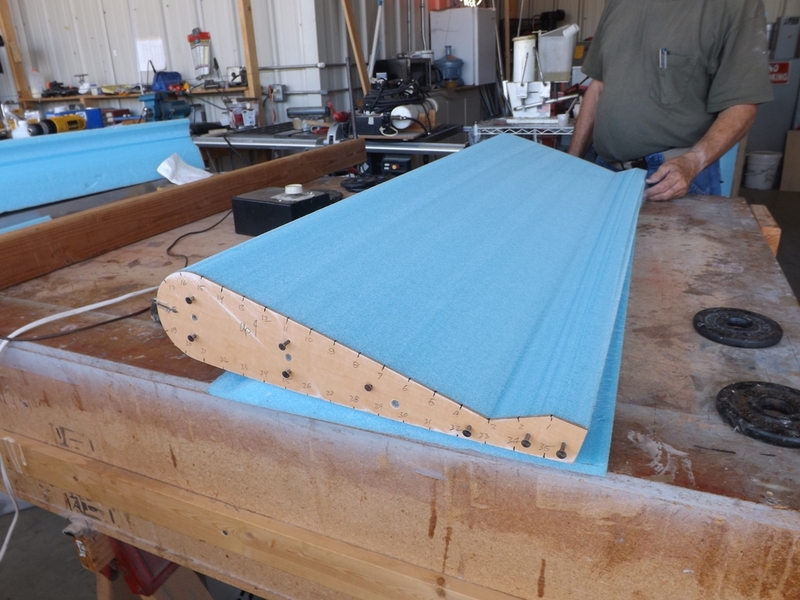 We used cotton/resin flox to bond the inboard torque tube tunnel to the spar web in the same bonding operation. Applying micro to elevator where leading edge will be attached. Leading edge in place with weights to get good contact. We let the resin cure for 3 hours, during which Chuck prepared fiberglass for the leading edge. Next Chuck began applying one and one half layers of fiberglass over the leading edges. The elevators were now fully covered and had their final shape. We were very pleased with the results. Chuck headed home. Friday, Darryl removed the elevators from the worktable. He spent nearly an hour removing duct tape and excess fiberglass from the two parts. The tailing edges were also smoothed using sandpaper. Once again the parts were put outside under black polyethylene sheeting and allowed to cure for 4 hours. This time the temperature reached 136.9 degrees! We got a really great cure on the parts. Chief assisting in black bag curing the two elevators. Later in the afternoon, Darryl cut out the first of three cutouts on the leading edge where one hinge bracket will go. This week we made great progress on our (second generation) elevators. As I mentioned before, we made the first set of elevators back in October, but discovered that not only were they very difficult to mount onto the horizontal stabilizer, but there was a problem with the leading edges bumping into the stabilizer when the elevators were deflected downward. We either had to build a new horizontal stabilizer, or redesign and make two new elevators. We chose to re-make the elevators. Although the new design is a bit more complex, it is easier to attach to the stabilizer and should function better than the first design. This past Saturday, I filled the holes in the 6 aluminum backing plates with flox (epoxy resin with cotton fibers). The flox ensures that the backing plates are very firmly anchored to the foam and fiberglass skins of the elevators. helps anchor them to the foam. It was not until Tuesday that I got back to work on the elevators. By then the flox was as hard a a rock. It took me a day’s work to grind off the excess using a wire wheel on a dremmel tool. It was very time consuming but the results were worth it. Chuck came over on Wednesday. I cut out the servo cover and cover backup plates out of aluminum sheet. I then drilled the screw holes in both parts to match. Next I positioned 8 nutplates under each hole on the backup plate and drilled holes for the rivets. Finally, I riveted each nutplate into place. I added beeswax to the nutplate holes and embedded the backup plate into the starboard elevator. 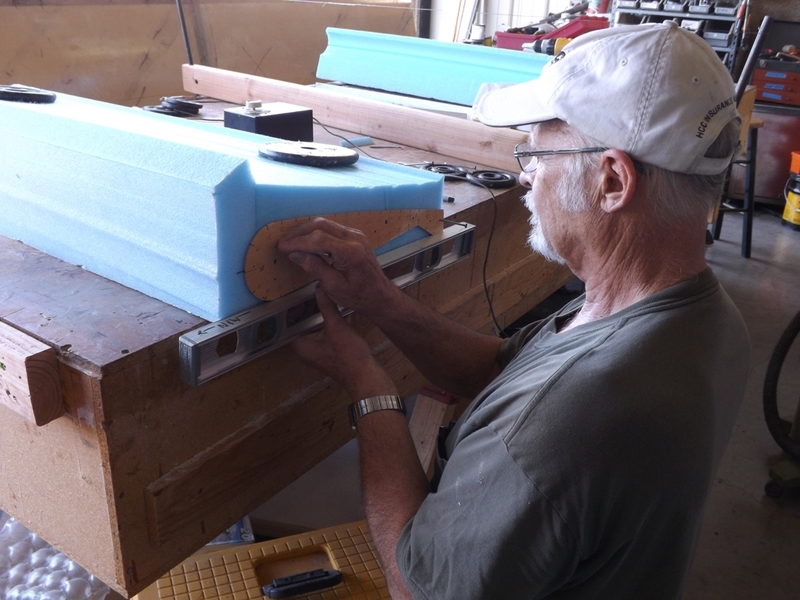 In the meantime Chuck cut out two foam pieces for mounting the tail light on the rudder (we made the rudder several weeks ago). mounted on the rudder. I will go into more detail in a few weeks. On Thursday we finished cleaning up the backup plates and then cut out the fiberglass for the top skins of the elevators. Next we vacuum the part to remove any dust . Before we wet out the glass cloth, we painted resin onto the foam surface. Next we added micro and worked it well into the foam surface using a squeegee tool. bonds really well to the foam. piece in the foreground will cover the entire length of an elevator. Next, we use the squeegee tool to press the glass tight against the foam. Once we have the glass positioned well, we can remove the plastic film. 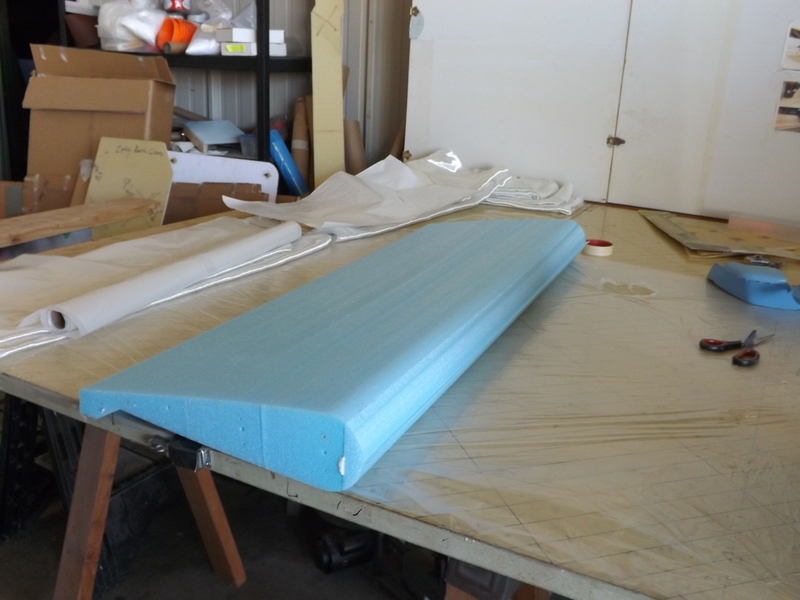 We spent 15 minutes with a paintbrush to get all the airbubbles worked out between the fiberglass and foam. We applied fiberglass to both elevator’s upper skins. Chuck cut out a thin piece of plywood to make a mounting plate for the servo. We painted one side with epoxy resin and embedded 4 screws to act as posts for the servo. resin and flox (cotton fibers and resin) are covering the screwheads. Friday, Darryl trimmed off the excess glass off the two elevators. He also filled the trailing edge trough with micro. The micro makes the trailing edge stiffer and stronger. That is a wrap for the week!